Gili Trawangan is one of 3 small idyllic atolls located off the North west coast of Lombok. Gili means island in the local Sasak dialect. Only 8 degrees south of the equator the climate is warm and tropical with 12 hours of sunlight a day and daily temperatures range from 24-34 degrees centigrade. The dry season is typically from April to October with November though to March the wet season. The Gilis are drier during the wet season than both Bali and Lombok with rainfall usually in the afternoons. 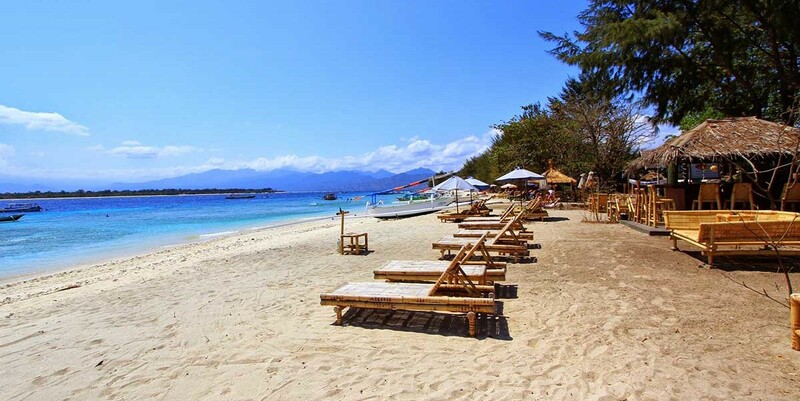 Gili Trawangan is the largest of the 3 Gili’s and is fringed with white sandy beaches and coral reef. Walking the circumference of the island takes around 1 hour and 45 minutes and is 6 and half kilometers. There are no motorized transport vehicles on the island and local transport is by bicycle or horse carts called Cidomos (pronounced Chi-do-mo). The island has a local population of approximately 3,500 people and is made up of local Sasak people who originate from Lombok and Bugis people who originate from Sulawesi. The vast majority of inhabitants are Muslim. Nominated by Lonely Planet as one of the top 10 destinations in the world in 2012 and appearing yearly in Trip advisor best of lists including best beach destination in Indonesia by Trip advisor in 2012, Gili Trawangan is a tropical island paradise. There is a good selection of accommodations, restaurants and bars on Trawangan. There are many small shops selling souvenirs, clothing and daily necessities. Activities available include diving, snorkeling and glass bottom boat trips, walking, bike riding, horse riding, paddle boarding and surfing, yoga, free diving, boat trips, massage and beauty treatments, fishing trips and island hopping. There is something for all visitors to enjoy. See our Trawangan activities page for more information. Gili Trawangan has a lively night life with a party night 6 nights a week that rotates around the island, live music venues and a full moon and dark moon party every month. There is a wide range of restaurants and a night food market every night with tasty local food in the art market area.